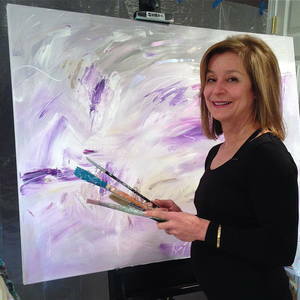 Eugenie Diserio returns to her roots - resuming painting after more than a twenty-five year hiatus. With fresh and rebooted creativity, her kinetic, contemplative paintings display both vibrant and muted color juxtapositions in evocative marks and brushstrokes. Eugenie does not remember a time as a child or teen that she did not draw and paint. Her work evolved from figurative and photo-realism to large abstract canvases that hang in many private collections. After earning a BFA from Tyler School of Art, Temple University and an MFA from Columbia University, she co-formed the seminal 80's art rock bands, Model Citizens, The Dance and Chandra whose music continues to be licensed and sampled in films and recordings today. In the late 90's, she founded Astronet, and as an Internet content pioneer, was designated one of Harvard Business Schools Top 10 Entrepreneurs of the Year. Eugenie credits the diverse journey of her life and ventures for trusting intuition in any creative process and believing in the power of attraction and positive energy. "The universe is rigged in our favor if we just pay attention and notice the signs along the way, " she says. A dedicated yoga practitioner, she tries to convey its stimulating physical energy and calming mindfulness through her painting. "Painting is transcendental like yoga and meditation," she says. " You lose your sense of time and space and remain keenly aware of the present moment – that’s real. I hope my paintings will create a similar experience for the viewer." Eugenie Diserio lives and works in Connecticut.